In 2007, my father returned from a 3-week trip through the Himalayas buzzing with the stories. 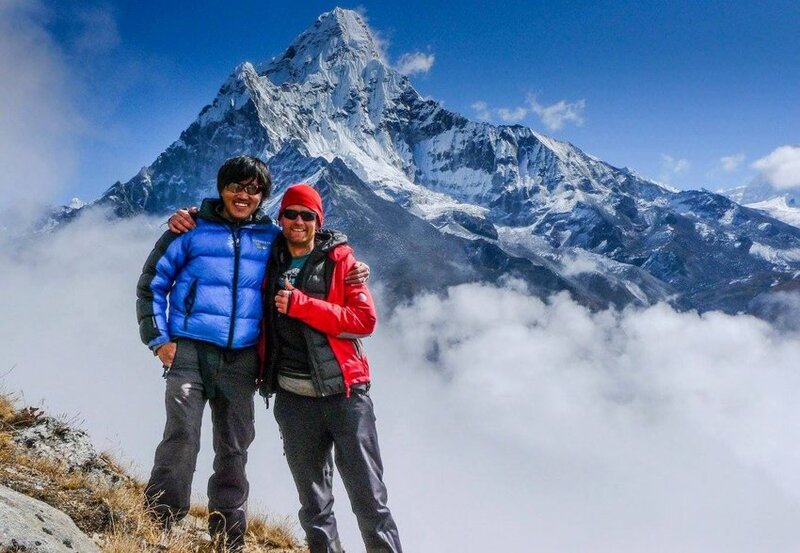 In typical dad fashion, he created a slideshow of incredible photos he'd captured while hiking to Everest base camp and exploring the surrounding region. With each slide came a story, ranging from magnificent (breakfast with a Himalayan view) to frightening (landing at the Nepal airport). One character featured predominantly in his stories, and it wasn't his friend who traveled with him. It was a man named Tashi Sherpa, a local guide my father had contracted to lead their trip. In all the stories Tashi Sherpa was kind and knowledgable, with a great sense of humor and a positive outlook on life. Most striking of all, was that this mild-mannered family man had summitted Mt. Everest over a dozen times. This was my introduction to the incredible world of Sherpas - a cultural group of people who reside in the harsh Himalayan world. Though their names typically appear only in gruesome news stories about avalanches, or as a side note in a tale of conquering a glorious peak, the Sherpa guides and porters are the true backbone of the Himalayan climbing community. Like Tashi Sherpa, Karma Sherpa has been guiding and working with treks and expeditions for almost his entire life. In recent years, he's started his own trekking company and nonprofit arm, Karma Project, to help give back to this incredible community. How did you start guiding expeditions? I became a porter for treks and expeditions when I was 15 years old. The porter work was difficult though. I didn't have the proper equipment or insurance. I didn't even have shoes! And sometimes the companies I worked for would pay very low wages, or I would only get tips and no wages at all. I worked as a porter in the Everest Region (Solukhumbu) for six years, and later I was able to work as an assistant cook. 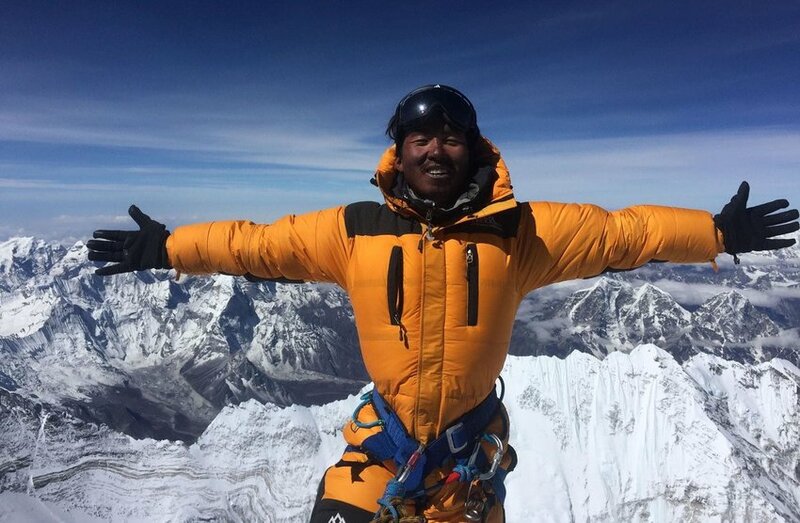 After gaining this experience I was fortunate enough to be selected for the Basic Mountaineering Climbing Course through the Nepal Mountaineering Association (NMA). This 45-day course included ice and rock climbing training, mountain leadership training, as well as basic first aid. From 2005 to 2007 I attended advanced level training courses, including high mountain rescue training. In 2005 I had the opportunity to work on a climb of Cho Oyu, then 2007 on Manaslu, 2008 on Everest via the South Col, 2009 on Manaslu and Dhauligiri, and in 2011 on AmaDablam. These are the more well-known peaks I have guided. In total I have guided more than 40 expeditions on 6,000 to 8,000 meter peaks. What do typical expeditions look like? Each expedition is different depending on what type of a peak is climbed, and where it is located. However, most expeditions start in Kathmandu where we do a briefing, gear check, and purchase any needed gear or equipment. Kathmandu is not an easy place for clients to stay because they are not used to the crowding and pollution, so usually we are in Kathmandu for only one or two days. Then we take a flight into the mountains. Most clients like to go to the Everest Region, so we fly into Lukla at an elevation of 2,860m. If clients are doing a popular climb like Island Peak, AmaDablam, or Everest then we carry small packs - usually 30 liters or so - and stay in lodges while we gradually hike up the trail toward our objective. This allows us to acclimatize gradually and stay rested and healthy. Usually the trek to basecamp is supported by porters or by pack animals including donkeys, zobyoks, and yaks. If we are going into a more remote area then we may need to carry camping equipment, and we may need to carry large packs so we have enough food until we are able to resupply after reaching villages on the other side of a pass. Once at base camp, our staff will chat with other guides and check the climbing route to determine if fixed lines need to be installed or replaced, what the hazards are, and what time we need to depart for the summit. For large expeditions all of the staff and sometimes even clients will work together to establish a good route for the season. Different expeditions on the mountain contribute to the cause by providing fixed-line, anchor materials, climbing Sherpas, and wages for those who take on the dangerous work of fixing ropes through technical sections of climbing. This process looks different each season, depending upon what companies are guiding on the mountain and what nationalities are up there. I had dreamed of starting my own expedition company for many years. Unfortunately this is not easy in Nepal because it requires a lot of money to get a licensed business. My friends Glen and Bonom helped me start Higher Path Treks in 2013. One of the great things about the business is it has allowed me to provide employment for many young people in my village. They are able to use their wages to pay for school, to pay for improvements on their homes, and to pay for education for their siblings. The people who work for Higher Path Treks are all so happy because we have known each other since we were very small. We are all family. And now most of our staff have been guiding on 8,000 meter peaks like Everest and have received a very good quality of training. We have also been able to provide training to young women in the village who want to work as trekking and climbing guides. It is unusual to have women working as trekking and climbing guides in Nepal- especially if they are from a rural area like Sibuje Village- so this is very exciting. What inspired you to create the Karma Project? In my culture it is the responsibility of every family member to give back to their family and their community. I was very lucky to get involved with tourism at an early age, which allowed me to have a better life than my parents did. Even when I was young I wanted to make things better for my siblings, my mother, and my step-father (my biological father died when I was 3). When I would go on treks and climbs with clients I would share the story of my life with them in the hope that maybe they could do something to help my family and my community. I met a man named Glen Young in 2008. He was from the USA and was working in tourism. He had come to Nepal between leading trips in Southeast Asia. He was a nice man, and we talked about Sibuje where I am from and about climbing in the Himalayas. Glen had worked as an alpine guide in Alaska and was very curious about my life. The next year he brought a client named Bonom Bohanec to Nepal with him and over the coming years the three of us climbed many 6,000 meter peaks. After an expedition on AmaDablam I suggested we visit my home in Sibuje Village. While we were there I asked Glen and Bonom if they could help to raise money for a hydroelectric project for the village. At the time we hoped that having electricity would allow Sibuje to have a clinic and electric heaters and stoves. Glen told me that he didn't know much about hydroelectricity or fundraising, but he wanted to help. A year went by and Glen and Bonom had begun raising money. Glen founded a non-profit in the United States that we decided to call Karma Project. I run Karma Project in Nepal with the help of the people of Sibuje Village, and Glen runs Karma Project in the United States and helps raise money and run trainings and projects. We feel like we are family. What's your favorite part of leading treks? I love meeting people from all over the world and spending time with them in beautiful places. I always learn so much about the world from my clients. Some of my closest friends are people who came with me on treks or climbs, and I have had an opportunity to visit some of them in their home countries as a result. As for my favorite climbs and treks, I really like the Southwest Ridge of AmaDablam and the Pikey Peak Trek in Everest Region. What advice do you have for potential climbers? My advice is to prepare well for your climb, and to treat local people and cultures with respect no matter how much money you have spent and no matter how you are feeling. High altitude mountaineering can be expensive, and can make many clients very tired, causes headaches, and can make some people sick to their stomach. Also, interpersonal dynamics on expeditions can be stressful. These circumstances sometimes make people angry. I have had some clients treat guides, porters, or the staff of hotels and lodges very badly. Most people come to the mountains to experience something beautiful and to have fun. This is really important. Expect things to be more emotionally, financially, and physically stressful than you anticipated, prepare for this, and have fun. 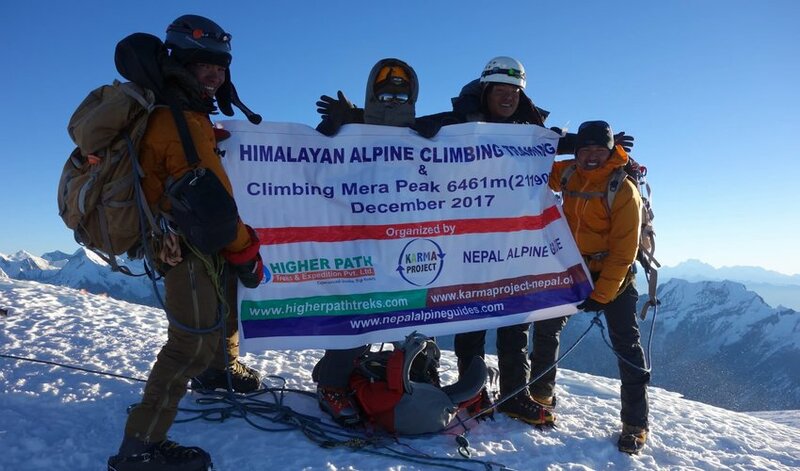 To learn more about Higher Path Treks and Karma Project, visit their website www.higherpathtreks.com.